Once upon a time over a mountain pass in Greenland a grayish-whiteish cloud chanced to drop a snowflake (we’ll call him Ivan) on the hillside below. Ivan wafted his way downward through the uneven breeze and settled into a drift at the top of a gully, overlooking the expansive landscape. He noted how lovely the view was in the brief moments that he was privy to it, but sadly –as is the case with most snowflakes– he was unable to enjoy it for long. Ivan was quickly buried beneath the accumulating mass of his brothers, sisters, and cousins. The days turned into weeks and the weeks turned into months as more clouds blew over head, dropping their snowflakes into Ivan’s gully. Where he once had enough space to feel generally comfortable in his place, the growing weight bearing down on him from the amassing snow pressed him tighter and tighter into his neighbours. Eventually it was impossible to tell where Ivan ended and the next snowflake began. As the years rolled on the pressure refused to let up; Ivan and his neighbours fused into crystals of glacial ice. 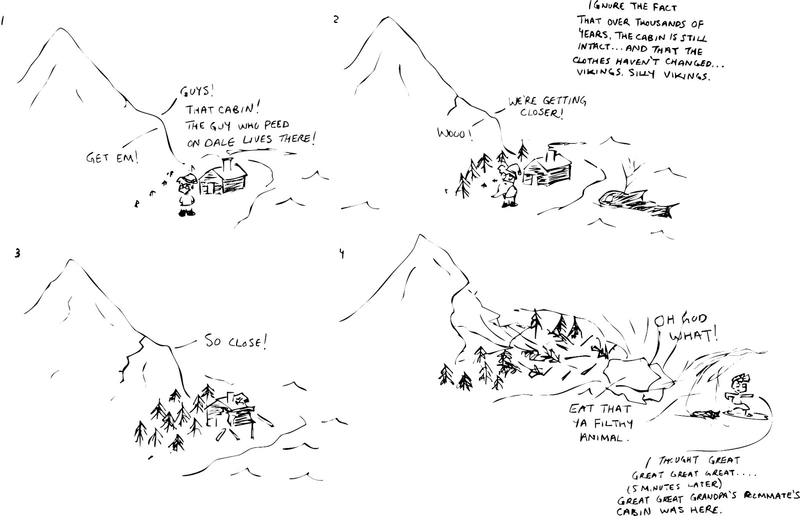 Dreading an eternity with no room to stretch out, they hatched a plan to escape from the mountainside. It was brilliant in its simplicity: The former snowflakes would follow the pull of gravity and inch their way down the hill. Their growing weight made the going easy and sometimes they could cover as much as 30 meters per day, picking up boulders and eroding the landscape as they went. Eventually they hoped to find their way to the sea, and glorious, maritime freedom! In the end, things took a bit longer than expected. 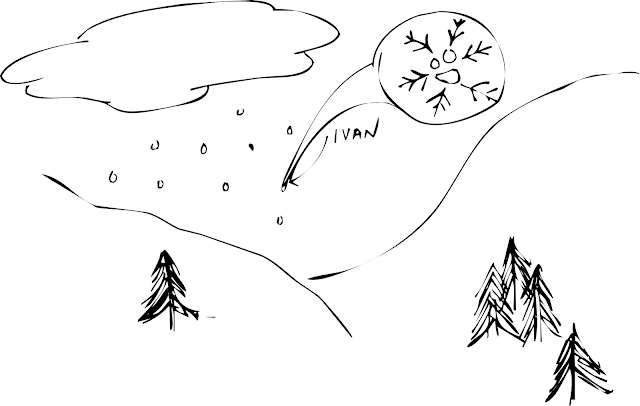 Ivan, as part of the glacier, came to learn the meaning of patience. Every day was more or less the same. Wake up. Be squished. Move down the hill a bit. Sleep. Repeat. But one day, after some 4,000 years of flowing down mountains and valleys, something changed. A thunderous crack tore through the ice, and the crystals on the downhill side of Ivan fell away! For the first time in what seemed like forever, he could see sunlight! He watched as the ice crystals he had come to call friends fell into the ocean and sent a gigantic rush of water in every direction. Far below he saw a crazed grad student with a wetsuit and surfboard catch the wave and ride it down the inlet. Ivan could feel the instability all around him and was infinitely excited at the thought that he could soon be free of the crushing glacier. Over the years, as he had moved lower down the valley, Ivan had felt the temperature rising but he had no idea that the end was so close. Just as the tension became too much to bear, another crack tore through the ice. 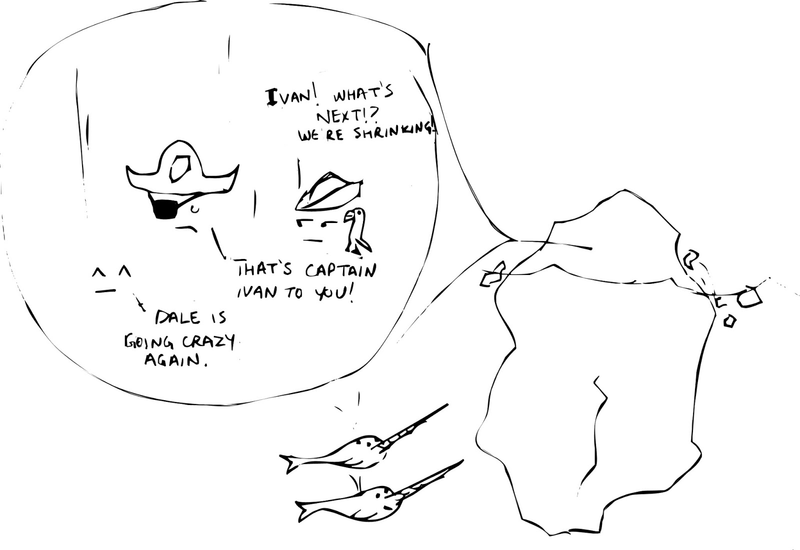 No longer a glacier, Ivan and his compatriots had graduated to iceberg status. The life an iceberg was everything they dreamed it could be. Incredible coastal views, sunshine, constant travel, and even the occasional flipping over as crystals melted and shifted the balancing point of the ice. Ivan was amazed at the things he saw both above and below the water, not least the intense blue colour that the iceberg had taken on as the compression of the glacier removed air bubbles and caused the ice to absorb all the shortest wavelengths of sunlight. But as awe inspiring as his life had become, Ivan knew that it would soon end. While glaciers can last for thousands of years, icebergs are lucky to see their second birthday. The ice crystals around him were melting into the sea with increasing speed. On his last night, pondering his mortality and wishing he could have made a bigger impact on the world, Ivan saw his chance. Out of the darkness a ship took form. As it neared the iceberg, Ivan organized his comrades. 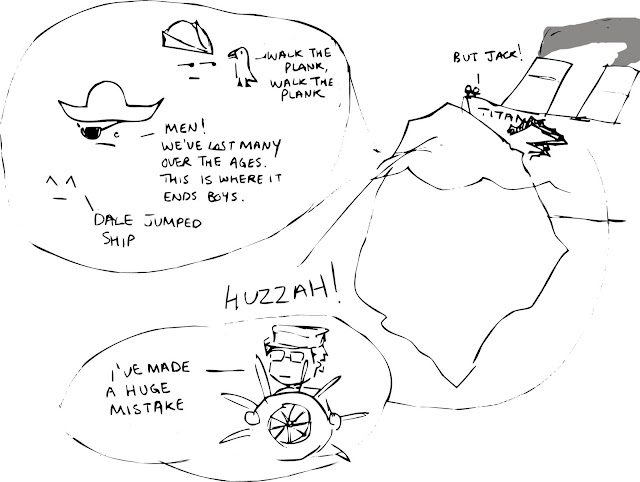 At the last possible moment, Ivan and his friends leapt from the night and tore into the ship’s hull. They cheered in triumph as they ripped through steel just below the waterline. Indeed, they had achieved what all ice crystals aspire to. 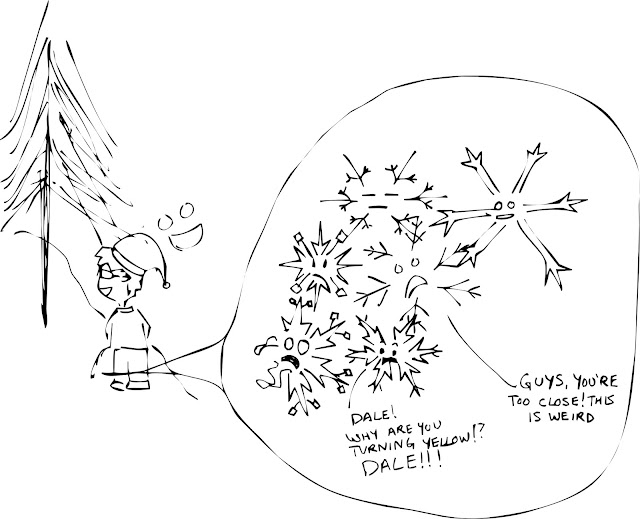 In conclusion, ice crystals are sociopaths. Lightning: The Sky! It's Exploding!